You can check (and update) the current owner details for both your subscription and your domain in the One.com control panel. Why can't I update the domain email address without an owner change? 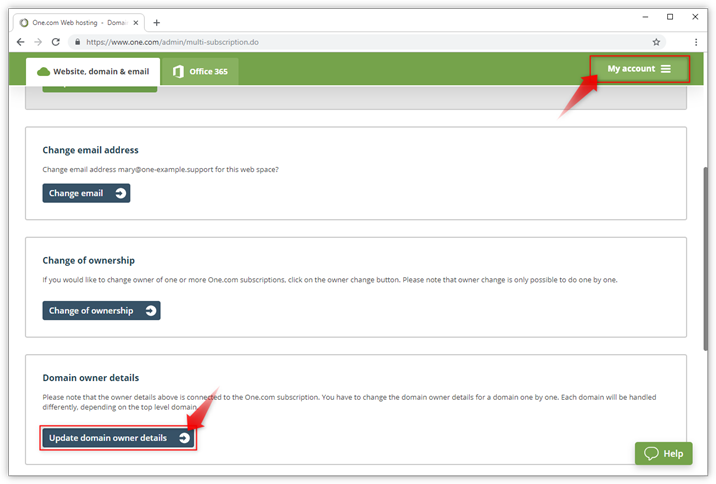 Note: If you host multiple domains with us under the same login (username), then your details can be located slightly different, but you can always find all contact information from the Subscription section. Click My account in the top-right corner and then Subscriptions. 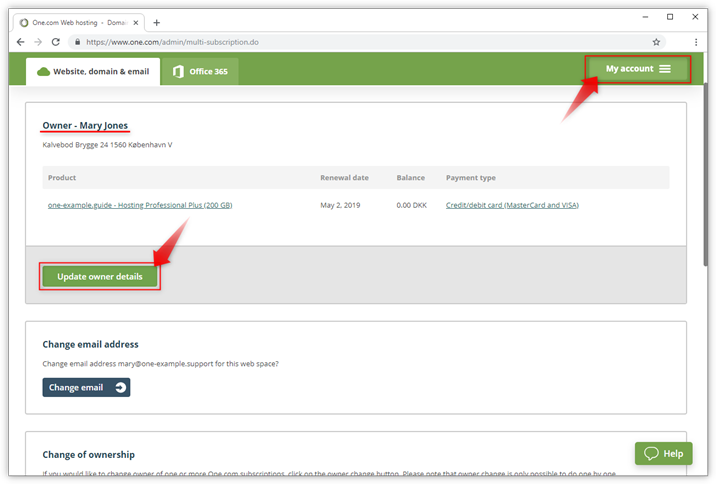 Click the green button Change owner details, in the owner section for the subscription you want to update. It's possible that there are different owners under one login. You can now see what the owner details for your subscription are, and update them. If you have only one subscription, scroll down for the domain owner details. Tip: If you want to change your contact email address you need to do this from a separate section. Scroll down and click the button Update domain owner details. Select the domain you want to know the details for. Click Update domain owner details again. You can now see the owner details that are registered on your domain, and also update them, provided that the owner of the subscription and the domain are the same. When it comes to gTLDs (com, net, org, etc. ), changes to the registrant email address are perceived as owner changes and thus require more validation. This policy is decided by ICANN, and One.com has to follow ICANN's guidelines. When it comes to ccTLDs (de, fr, se, etc.) different rules apply, and you can in most cases simply update them in the control panel. If you don't want to do the owner change procedure from the control panel, you can also fill out the change contact details form.